coming soon: New Website with better graphics, galleries, podcasts, and easier navigation! The Panchiaki Korais Society - Chapter 1, will crown the next Miss Chios during their Annual Dinner Dance, 7:00PM, on Saturday, February 19, 2011, at the Terrace on the Park, located at 52-11 111th Street, Flushing, NY 11368. 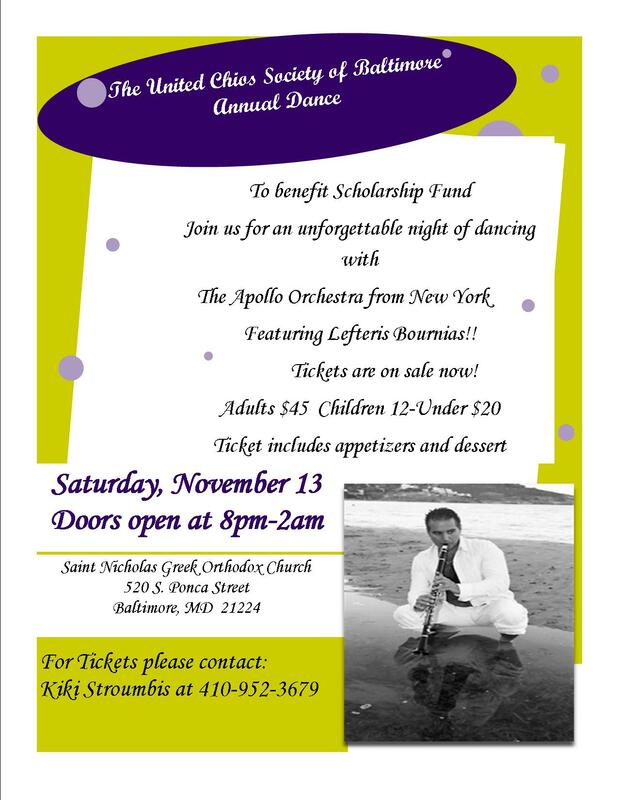 The Board of Directors and the Homeric Award Committee of the Chian Federation kindly request the honor of your presence at the 31st Annual Homeric Award Gala, honoring Mr. Philip Christopher, President of the International Coordinating Committee “Justice for Cyprus” (PSEKA), and President of the Pancyprian Association of America. 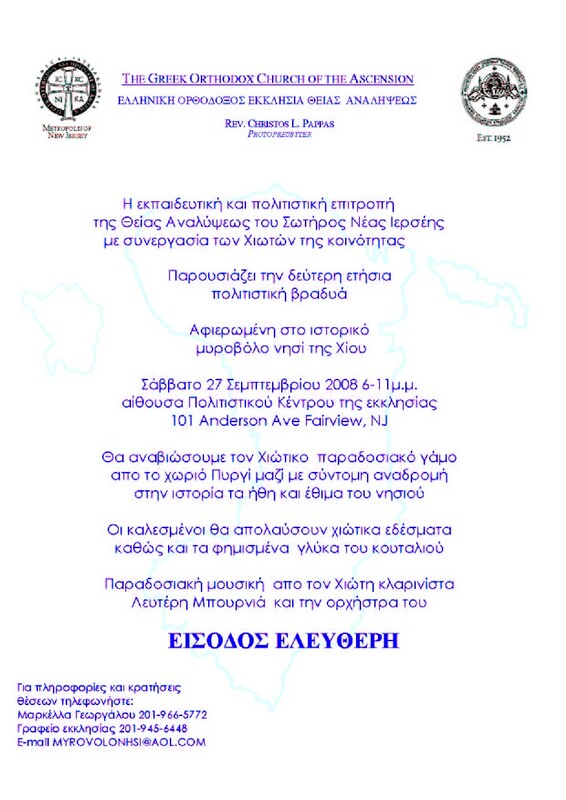 This special ceremony will take place on Saturday, November 13th, 2010 at 7:00 pm, at the Hellenic American Cultural Center of the Chian Federation located at 44-01 Broadway, Astoria, New York. The Homeric Award was established thirty one years ago to honor individuals who have distinguished themselves as advocates of human rights and whose strong and abiding commitment to the Hellenic ideals of freedom and democracy is an exemplary model to humanity. During his long service, Mr. Christopher has been a staunch advocate of the ideals upon which the Homeric Award was founded. 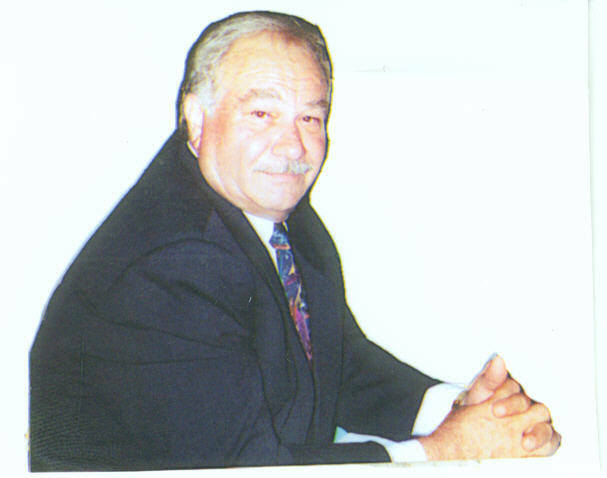 Born in Kyrenia, Cyprus, Mr. Christopher immigrated to the United States with his family when he was 10 years old. He is one of the most highly regarded leaders in the Greek Cypriot and Greek American communities, marking three decades of ongoing advocacy for these groups. The Chian Federation represents a large number of Chian societies in the Greater New York Metropolitan area. Since its inception in 1974, the Federation has evolved into a community-based non-profit organization which provides a myriad of services to its members and the surrounding community. Dafnonas is a picturesque Chian village on the slopes of Mount “Kakia Skala, overlooking Kampochora and the coast of Ionia (Asia Minor, Anatolia). The village was named after dafnes (laurels). Tradition states that the village comes from an old settlement at Petrana, at Kanavoutsata or at Lavrina. It was transferred to its present location, at the end of the 10th and beginning of 11th century. The town has the churches of St. Panteleimon, patron saint and St. George. Medieval ruins showing signs of the Genoese occupation predominate in the town. Nickolas Rodinos, Our Past Supreme President (1986-1988), passed away on Tuesday, August 4th, 2009 after a long illness. Mr. Rodinos, 76, was born in the capital "Chora," of the island of Chios, Greece on July 20th, 1933. He was the beloved husband of the late Angeliki, nee Gineris; devoted father of Kathryn (Alex) Bravos and George (Kathleen); fond grandfather of Anastasia and Michael Bravos and Nicholas Rodinos; dearest brother of Ipatia (Dimitri) Anast; fond brother-in-law of Ted (the late Mary) Svarnias and Louis (Afrodite) Gineris; dear uncle of George (Kim) Anast, Nick (Theresa) Anast, Nicholas Svarnias, George (Michele) Svarnias, George (Eleftheria) Gineris and John Gineris; and a devoted great-uncle to many. Mr. Rodinos came to the United States of America in 1953, he served on the Parish Council of Holy Trinity Greek Orthodox Church, and as chanter at Holy Trinity and Assumption Churches. He was active as the Democratic Precinct Captain in Elmwood Park, IL. He served as Past President, Secretary and Treasurer of the Panchiakon Society "Pelineon" of Chicago, and also as Past Supreme Governor of the Chios Societies of America and Canada. His funeral service was held Saturday, Aug. 8th, 2009. Come join the Young Adults Association of Kambia for an unforgettable party. On October 25th 2008, we will be hosting our first annual Dance. The party starts at 11pm and will feature Live Music by the band of Yiannis Lignos and George Rambos. This party is to celebrate the Next Generation of Chians. So come and meet new people and old friends and party Chios style. Admission is $50 and includes buffet and Open-Bar. 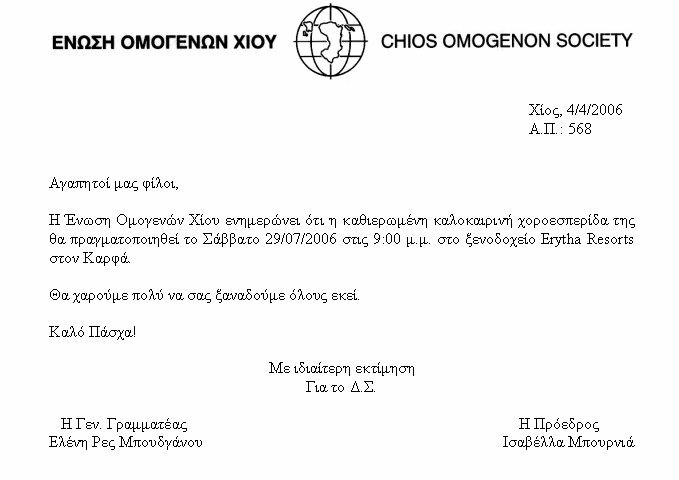 O SullogoV NeolaiaV Kampiwn kai Agrelopou parousiazei thn prwth ethsia coroesperida gia thn neolaia thV Ciou stiV 25 Oktwbriou 2008 sto Ciwtiko Spiti. Einai eukairia na gnwristei h nea genia thV Ciou kai na xanabreqei me paliouV filouV. To glenti arcizei stiV 11m.m. me zwntanh mousikh apo thn orchstra tou Giannh Lignou kai tou Gewrgo Rampou. Eucomaste na saV doume gia na glentisoume Ciwtika kai na perasoume mia axecasth bradia. H eisodoV einai $50. 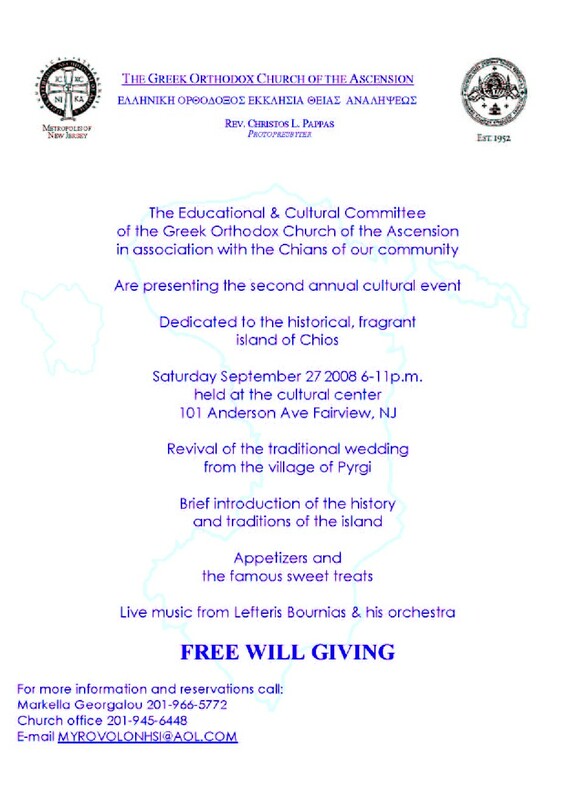 On Saturday, September 27, 2008, the Educational and Cultural Committee of the Greek Orthodox Church of the Ascension, Fairview, NJ in association with the Chians of their community are presenting the Second Annual Cultural Event, dedicated to the historical island of Chios. The Chian Federation will honor George Almiroudis on May 20, 2006, at the Cultural Center of the Chian Federation, in Astoria, NY. See their eNews for Details. The Panchiaki Korais Society - Chapter 1, honored Dr. Theodore Kalamotousakis and Mr. Manos Moraitis during their Annual Dinner Dance on February 18, 2006, at the Sand Castle, in Long Island, NY. The Chian Federation honored Congressman Joseph Crowley with the 28th Annual Homeric Award on January 28, 2006, at the Cultural Center of the Chian Federation, in Astoria, NY. The Chios Society Cleveland - Chapter 7, honored Bert and Marjorie Moyar with the Chian Achievement Award during their 68th Annual Banquet & Dance, on November 19, 2005. The Chian Federation of NY celebrate their 30th Anniversary on the weekend of June 11-12, 2005, at the Cultural Center of the Chian Federation, in Astoria, NY. The Panchiaki Korais Society - Chapter 1, honors John & Evangelia Klidas during their Annual Dinner on February 12, 2005, at the Sand Castle, in Long Island, NY. The Chios Society Cleveland - Chapter 7, honors Dean G. Chimples with the Chian Achievement Award during their 67th Annual Banquet & Dance, on November 20, 2004. 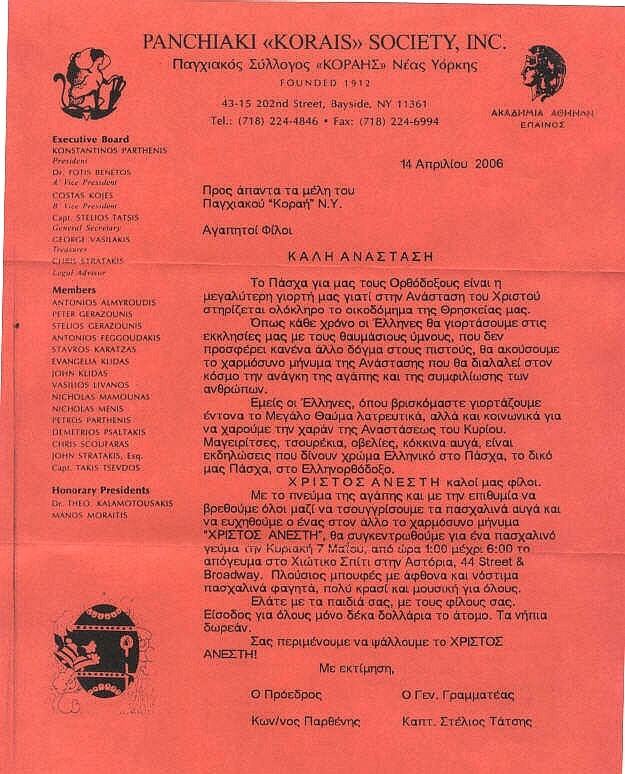 The Chian Federation of NY honors Dr. Stamatios Krimigis with the 27th Annual Homeric Award on November 20, 2004, at the Chian Cultural Center Hall, in Astoria, NY.